Will a third generation clone have the same DNA as the original? No, it almost certainly won’t! Depending on your “starting” cell, a clone from the clone of a clone might just be a bag of mutations on the brink of dying from cancer. This might all seem weird since the word “clone” usually means a creature that is completely identical to the original. But it turns out that a clone isn’t really identical. You see, small changes in your DNA can and do happen over your lifetime. We call these changes ‘mutations,’ and they can happen for lots of different reasons. Over the lifetime of a living being, these changes build up. So if you took some DNA from a clone and made a second generation clone, that DNA would have lots of differences that weren’t in the original. And it would be even worse for a clone from that second generation clone. The most differences would probably be if you used skin cells to make the clone. The DNA in these cells can end up with thousands of mutations over a life time. The best cells to use would most likely be the ones that go on to become either sperm or eggs. These are the most protected cells in our bodies. Still, even with those there’d be new mutations in the clone. And at least some of these mutations can matter for the health of a person. Or a clone. DNA is the instructions for making a living thing. We have one head, two arms, and all the things that make us human because of these instructions. There are also instructions that keep our cells from turning cancerous, give us our eye color, and lots of other things that makes each one of us unique. When a mutation happens, it might change these instructions. This could be a really big problem! Brown eyes instead of blue might not be a big deal but two heads instead of one could be really bad. As could cells growing out of control and eventually becoming cancer. DNA can get mutated for lots of reasons. When cells divide into new cells, they need to make a copy of their DNA. Sometimes, cells make mistakes during copying and create mutations. The environment can cause changes in DNA, too. Certain chemicals or radiation (like from the sun) can damage DNA. The cell usually does a pretty good job of fixing damaged DNA, but is not always perfect. This is why making a clone from a skin cell isn’t a great idea – skin is exposed to lots of sunlight so these cells often end up with lots of mutations. In fact, a recent study showed that skin cells have literally thousands of mutations by the time someone is middle aged. Not all mutations change your DNA instructions, though. Many mutations are “silent” and don’t affect anything. But skin cells get so many mutations that there’s a greater chance of harmful changes happening. And it gets worse. Because of how things work, it turns out that over time cells with mutations that make them grow better end up taking over. These cells are on their way to cancer. Mutations aren’t the only problem for clones, though. Cells have special sections of DNA called telomeres, and over time these can be damaged, too. This might make the clone of a clone of a clone live for only a brief time. Shortened Ends Means Shortened Life? Inside the cell, DNA is packed into bundles that we call chromosomes. Telomeres are pieces of DNA at the ends of chromosomes that protect the DNA from getting damaged there. Think of telomeres as “caps” for DNA. Every time DNA gets copied, the telomere “caps” get a little bit smaller. As you grow older, the telomeres on your DNA keep getting shorter. Once telomeres become too short, they can’t protect your DNA anymore. Scientists think that telomere shortening might jumble our DNA as we age. This may help explain some of the changes that happen to our bodies as we get older. It may also explain why a clone may not live very long. Cells from an adult have shorter telomeres than cells from a baby, because the adult cells have divided more times as the person grew and lived his or her life. If we make a clone from adult cells, the clone might start out with shorter telomeres. If this happens, the clone cells will not be able to divide as many times as normal cells. This could lead to a shorter life. Let’s use a real-life clone as an example. You’ve probably heard of Dolly, the famous sheep who was cloned back in 1996. 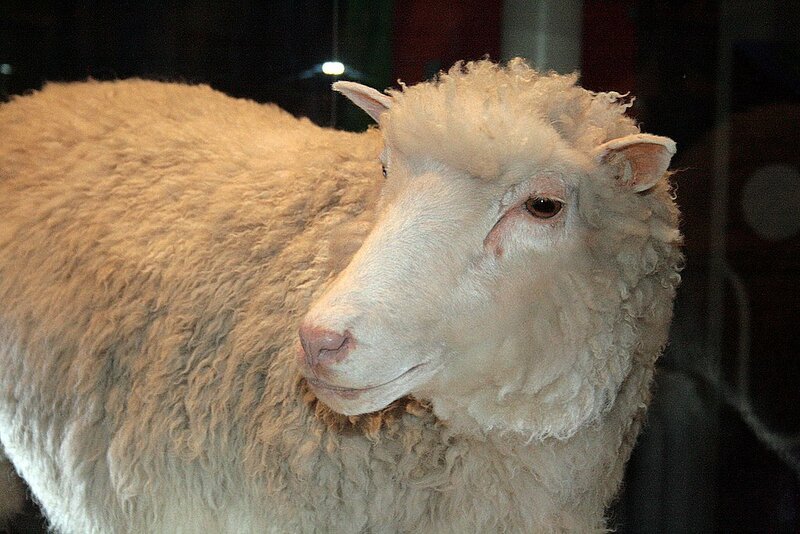 Dolly was created by taking some DNA from another sheep and putting this DNA into a new cell. This new cell multiplied and grew into Dolly the sheep. The researchers who cloned Dolly the sheep noticed that Dolly’s telomeres were shorter than normal. Dolly’s telomeres were actually closer in size to a sheep 4 years older than her! In fact, Dolly only lived about half as long as a normal sheep because she got lung cancer at a young age. Scientists suspected that Dolly’s short telomeres may have caused her early death. This made some scientists worried that all clones might have shorter lives. However, a recent study examined a group of 7 to 9 year old cloned sheep (including some sheep created using the same DNA used to make Dolly!). The researchers found that these sheep were all healthy compared to non-cloned sheep of the same age – even the sheep with the same DNA as Dolly! These results suggest that telomeres might not be a problem for all clones, after all. But the scientists who did this study didn’t measure the telomeres of these sheep. It’s possible that the healthy sheep had normal telomeres. It’s also possible that shortened telomeres don’t always cause a shorter life. Scientists will need to do more research to be sure. Maybe Dolly was just unlucky. This paints a pretty dire picture of a third generation clone. A shorter life and cancer to name just a few potential problems. But it doesn’t have to be so bad. We talked about how it wouldn’t be a great idea to make a clone from a skin cell, because skin cells get lots of mutations. They will also have shorter telomeres having gone through lots of cell divisions. This is why they are not a great starting point for your clone. A better starting point would be to use a special type of cell called a germ cell. These are the ones that develop into sperm or egg cells. These are great because they have longer telomeres and fewer mutations than other cells. Which makes sense if we think about what they are used for. Any mutations that happen in sperm or egg cells will be passed down to the next generation. This might not be good for the health of the offspring, so our body has developed special ways of protecting germ cells from becoming mutated. Because of this, cloning from germ cells would mean fewer starting mutations. Germ cells are also special because they can keep their telomeres from getting smaller, unlike most other cells in the body. So if you cloned from a germ cell, the DNA probably wouldn’t get jumbled as soon and your clone might live a longer life. The bottom line is if you are going to make a clone, use germ cells. Then, even a third generation clone wouldn’t be too different from the original. Especially if you take the cells when the creature being cloned is young. Should we use cloning to bring back extinct animals?